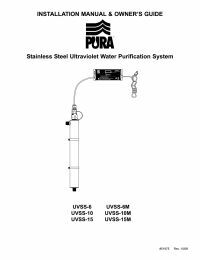 The Pura 89510 Quartz Sleeve is the genuine replacement sleeve for use with Pura's UVSS-6 & UVSS-6M systems. The Pura 89510 quartz sleeve provides thermal protection for the system's UV lamp and protects it from possible damage. NOTE: It is recommended to clean and inspect the quartz sleeve when changing your filters, and each year when replacing your Pura 89500 UV Lamp. Replace your Pura 89500 quartz sleeve if damaged or if it cannot be cleaned by non-abrasive methods.